courtesy of Wikipedia's article, "Elephantine." 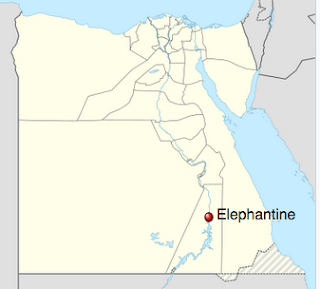 Over 2,400 years ago there was an active community of Jewish immigrants living on the island of Elephantine on the Nile River in Egypt. Remarkably, they had a small temple and conducted religious rituals there, even with the apparent approval of Jewish leaders in Jerusalem. This helps us understand why other Jews far from Jerusalem might also have felt it was proper to not only offer sacrifices, but to build shrines or temples, although it has long assumed that temple worship and sacrifices absolutely had to be centralized in Jerusalem and that "no self-respecting Jew" would do what Lehi and Nephi did. It's a topic I've discussed a couple of times here and on my website (see "Ancient Temples, Shrines, and Altars Outside of Jerusalem," "Another Reversal: Why Is King David So Absent in Book of Mormon Discourse?,"
and "Lessons from the Elephantine Papyri Regarding Book of Mormon Names and Nephi's Temple." The story of the surprising discovery of the papyri from Elephantine and the evidence of a small, functional temple there is discussed by Stephen Gabriel Rosenberg, "Was there a Jewish temple in ancient Egypt?," Jerusalem Post, July 1, 2013. Records from Elephantine do more than strengthen the plausibility of Lehi and Nephi's actions in offering sacrifice outside of Jerusalem and later building their own temple in the New World. A few years ago Professor Jeffrey R. Chadwick at BYU pointed out that the name ŚRYH (Seraiah/Sariah) in a document from Elephantine may provide support for the authenticity of that name in the Book of Mormon as a genuine ancient Jewish female name. See Jeffrey R. Chadwick, "Sariah in the Elephantine Papyri," Journal of Book of Mormon Studies 2/2 (1993):196-198. For a while, the case for authenticity of Sariah's name was subject to some uncertainty due to missing portions of the key document, as noted by BYU professor Paul Hoskisson (a fact also pointed out by Chadwick, but with good reasons for believing his reconstruction is correct, including the fact that two other non-LDS scholars independently reconstructed it the same way). Hoskisson wrote of the need for further investigation to confirm this potential evidence. Fortunately, a second more complete document from Elephantine with the same name has been found and translated, providing indisputable proof for Sariah not only as a real Jewish female name, but a real female name linked to Lehi's era and his Northern Kingdom origins. It's a remarkable coincidence, like many dozens of other allegedly random coincidences that seem to continually turn "obvious" Book of Mormon blunders into noteworthy evidences of plausibility. Why that keeps happening could be called, I suppose, the "Elephantine in the room." Nonetheless, new evidence that completely satisfies Hoskisson’s call for a more “clear-cut” example has been found. Porten and Yardeni document ŚRYH as a Hebrew feminine name not once, but twice among the Aramaic documents at Elephantine.10 A list of names on an ostracon found there, dated to the second half of the fifth century bce, includes śryh brt […] ([…]שריה ברת), “Seraiah daughter of […].”11 The name of Seraiah’s (or Sariah’s) parent is broken off, but both “Seraiah” (śryh) and “daughter” (brt) are attested in full,12 thus providing an undeniable example of ŚRYH as a female name [see Figure 2 in Rappleye's article]. In light of Lehi’s ancestors coming from northern Israel (1 Nephi 5:14, 16), ca. 720 bce,13 it is also interesting to note that, according to Karel van der Toorn, the Jewish community at Elephantine ultimately has its roots in northern Israel, ca. 700 bce.14 After surveying the evidence from deity names in the Aramaic texts, van der Toorn concludes, “the entire picture of the religious life at Elephantine and Syene strongly suggest that the historical core of the communities came from Northern Israel.” He further notes “the emigrants from Northern Israel would have entered Egypt by way of Judah” and suspects “some of them stayed in Judah for a significant length of time” before migrating to Egypt sometime in the seventh century bce.15 Therefore, the founders of the Elephantine community were likely contemporaries of Lehi or his parents and were similarly Israelites of northern stock who initially settled in Judah. These details add to the significance of these two references to women named ŚRYH (Seraiah/Sariah) at Elephantine. In both the Hebrew Bible and the epigraphic evidence from Judah, ŚRYH(W) is only attested as a male’s name.16 While this could simply be due to the limitations of our available data set,17 it is also possible the attestation of ŚRYH as a woman’s name both in the Book of Mormon and at Elephantine and only in these sources, reflects a specifically northern Israelite practice. While Book of Mormon studies related to its New World setting may be complicated by the uncertainty in its physical setting and the confusing (and often unnecessary) debates about various candidates that have been proposed, including Mesoamerica, the Great Lakes region, the Baja California Peninsula, Peru, Florida, etc., some of the most powerful and least uncertain evidence related to Book of Mormon authenticity comes from the Old World. In the far less uncertain locations of relevant Old World sites (we know where Jerusalem was!) and peoples relevant to the Book of Mormon, with higher probability of relevant records being intact (less likely to have been burned in insane massive purges of ancient records by Spanish priests), we can more readily confirm elements such as the authenticity of its many names, the plausibility of the Arabian journey, the "up" and "down" topography described by Nephi for Israel, and the setting that Lehi as a prophet faced in Jerusalem. The newly strengthened evidence for Sariah is part of that treasure trove. Which of course, as our critics will surely explain, is just a "nothing burger" and random coincidence, like everything else. But somehow, I keep putting on weight with all these nothing burgers. Maybe it's the fries. It’s not the fries, Jeff, it’s the methodology. If you do enough data dredging you can always turn up results that look like bull’s eyes but are in fact just coincidences. But don’t take my word for it. Instead, how about asking the Interpreter folks to hire a couple of independent researchers—say, a comparative linguist and a statistics expert who understands concepts like data dredging, the Texas Sharpshooter fallacy, and the multiple comparisons problem—to evaluate the methodology of LDS apologetics? The LDS do not have decent, honest, moral and ethical people doing Apologetics. The ones doing Apologetics now do more harm than good....in many ways and areas. Many people abandon the LDS church because of these so called Apologists. Engaging independent researchers to look at LDS data etc would be a step in the right direction. Unfortunately this will never happen. The LDS leaders are as arrogant and lacking morals and ethics as the Apologists. Past LDS higher ups stated that the LDS church was being led down the wrong path by its very own leaders. Like all the Christian religions, the LDS church has gone to the Left/Alt Left; LDS leaders want the praises of the world more than anything; has abandoned many, many past teachings and has thrown past leaders under the bus. Here is the amazing thing -- FARMS did exactly what is being suggested and provided Book of Mormon names to top Ancient Near Eastern onomastic scholars without revealing that they were from the Book of Mormon. Result? They found significant concentration among names coming from just before the Babylonian captivity around the Norther Kingdom and Jerusalem. The results were quite specific. Saying that none of the folks working on Book of Mormon names are ethical and decent and that all folks working on names or "doing apologetics" are dishonest is the height of hubris and stupidity -- and frankly simple libel. Such libel coming from a person who does not have the honesty to provide a name says far more about you than about anyone else. Your sheer bravado and cowardice to to give us your identity so that we can see who is making such outlandish statements tells me that you are not willing to stand behind what you say because you know it is simple nonsense that would shame you if we knew who you are. The scholarship on names has shown a number of "bulls-eyes" that merit consideration. Show me a study showing that such names just show up at random in a ms. as you argue and then we have something to back you mere assertion without evidence. Blake - please prove us your full name, street address, date of birth, and current phone number. Otherwise, as you have pointed out, you know everything you said above is complete nonsense and you are ashamed of it.